There are a plethora of eye creams, serums and gels on the market out there that can leave you feeling totally confused about what the hell you should actually be using! It’s also a product sector that often sees over use and people using formulas far too rich for their skin, so it’s really nice to see the geniuses at Clarins come out with a simple, easy to use eye solution that does exactly what it says. 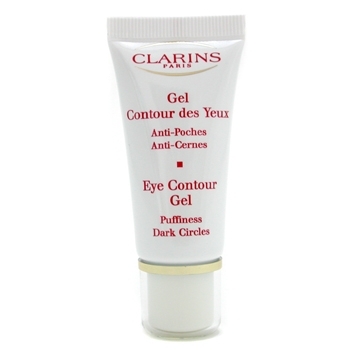 Simply called Eye Contour Gel, it is a refreshing daily treatment that reduces puffiness, minimises dark circles and tones the eyelids. The super gentle gel formula soothes eyes, giving a feeling of freshness to the skin that surrounds them while eliminating early morning puffiness. Ultra-lightweight and non-oily, it is suitable for even the most sensitive eyes and contact lens wearers, too. Active ingredients in this puppy include Serrated Palmetto to decongests, Wild Rose to drain and prevent puffiness and Butcher's Broom, which improves circulation and prevents dark circles.